Former premier Tun Dr Mahathir Mohamad said that Malaysia will probably not be able to become a developed nation in 12 years’ time - the key target his Vision 2020. The 83-year-old statesman, whose administration had set the target in 1990, painted this bleak picture at an economic forum in the administrative capital Putrajaya. "I have a feeling we are not going to achieve that (vision)," Mahathir said when answering a question from the floor after speaking on the future of Malaysia in light of the global financial uncertainties. 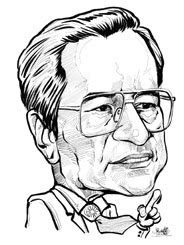 Mahathir said the 1997 Asian financial crisis, the current global economic crisis were unanticipated factors preventing the achievement of the vision. But he also pinned the blame on the country's new leadership which took over after he stepped down in 2003. The former premier was one of two speakers - the other was 2003 Nobel Laureate in Economics Robert F Engle - addressing a forum on the current financial market volatility which was jointly-organised by the Perdana Leadership Foundation and the Putrajaya Holdings Bhd. In his speech, Mahathir described the current government as a "weakened" entity faced with a situation unprecedented in the country's 50-year history of political instability. According to him, the present government has mistakenly tried to appease "extremists, racists, and other discontents” instead of making the necessary - though unpopular - decisions. During his time, said Mahathir, the government rebuffed calls by the International Monetary Fund (IMF) to liberalise the economy and increase competition among all the ethnic groups in return for the fund’s loans. He said the government's move then - which was a continuation of its past policies - was taken in order to maintain social cohesion while maintaining economic growth on its own terms. "For 50 years, political stability was what attracted investors, both foreign and local. Now, a weak government has tried to regain popularity by pandering to the demands of extremists. "The floodgates have been opened, and all kinds of sensitive issues are being debated. The result is not the kind of liberal society that the policy was supposed to (achieve). The result is the resurgence of racism on the part of all ethnic groups. "In this atmosphere, the government will find it difficult to handle the oncoming financial and economic instability. The fear of political repercussions will prevent the government from seeking decisive, if unpopular, measures," he said. Though unsaid, Mahathir appeared to be arguing for the government to maintain a tight grip on civil liberties. Economic stimulus package a pittance Admittedly, said Mahathir, the current global financial and economic crisis is a very difficult one to handle. But the government had erroneously thought it could tackle the accompanying problems "by making a few billion dollars available", said Mahathir in reference to the recently announced RM 7 billion economic stimulus package. It is not impossible to weather through the crisis, but the government must be serious about handling the issues by identifying "the problem areas", understanding "the underlying causes" and devising "plans to counter" the damaging effect of the global crisis. Mahathir also said the economic development corridors launched by the government in several regions across the country will not resolve the problems as there is a critical lack of infrastructure and basic amenities such as water and electricity supply in those areas. Later during the question-and-answer session, a participant asked Mahathir whether he thought government leaders were spending too much time and resources tackling the problem of political instability to the detriment of addressing the economic crisis. In response, Mahathir said: "Unless we resolve that (political crisis), we cannot focus on (putting back on track) the economic growth of our country." Once that is done, he added, the government must concentrate on pinpointing all the issues pertaining to the economic and financial problems and devising ways to tackle them. "During the 1997 financial crisis, we sat down everyday from 9am to 1pm" to understand all the data relating to the problems then and formulating and implementing a plan of action to resolve them, he said.